We are not the typical independent senior living facility. Here, you can be as private or as social as you like. Our residents come and go as they please. Some have their own vehicles, and for those who don't drive, we provide scheduled transportation to the grocery store, special events, and local doctor's offices.Vista Village is a healthy alternative for people who aren't ready for assisted living or skilled nursing situations. We provide a safe, home environment for elders without the responsibilities of maintaining a household and yard. At Vista Village you are on your own, but not alone. We have a staff member on site 24/7 to respond to emergency and non-emergency events. We have our own maintenance crew, housekeepers, cooks, activities director, and office management team. We encourage residents at Vista Village to remain independent as long as they are able. 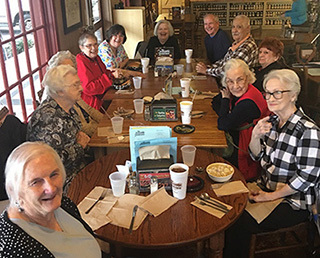 When residents need those next steps before assisted living, we work with our sister company Care Coordinators, to provide additional services such as dressing, bathing and companionship. Although we do not have a medical team on staff, we work closely with several of the in-home care agencies and allow them to provide care to individuals on site. Private caregivers are also welcome.